When Crow Lake by Mary Lawson was published in 2002 it was an immediate hit with readers of literary fiction. Mary Lawson’s debut novel brought us a story that takes place in the Ontario north – a place she herself left many years ago but has returned to in her two subsequent novels The Other Side of the Bridge, published in 2006, and now Road Ends. Mary Lawson grew up in southwestern Ontario and has lived in England for decades, but she spent summers at a cottage in the north and it is obvious that landscape has never left her. We meet the large Cartwright family, in the small town of Struan – some distance from New Liskeard – close to Crow Lake. It is 1967 and Tom Cartwright, the eldest brother, is home for the summer from University. The same gang that went to high school together, including Tom and his friend Rob, gather on the beach for an all night party involving a lot of drinking. The devastating result is that a teenage drunk driver is responsible for the death of a young child. The novel opens with the suicide of the young driver, the only result is more tragedy. We then meet Megan – the only daughter in the Cartwright family – now 21 years old and ready to leave home. She has taken on the role of mother for too long. As her mother produces yet another child it has become Megan’s job to care for them all. Now, with a friend in England inviting her to come Megan has made her decision to leave. Edward Cartwright is the father of seven children, although he does everything possible to avoid spending any time with them. Edward is the local bank manager, eats his meals at the local café and retreats to his study when he is at home. His wife, Emily, has lost herself in motherhood – baby after baby after baby. It is Megan, Tom and Edward who tell the story. From 1966 to 1969. We come to know the intimate thoughts, dreams and demons of each of these characters. Edward is haunted by childhood experiences, and Tom by more recent tragedy. And then there is Adam, the youngest at the beginning of the story but soon displaced by a new infant. Adam is the one they all cannot help but love, sensitive, intelligent, anxious Adam. He is the one Megan will miss when she leaves, and the only one Tom comes out of his own despair to care for, and even Edward recognizes the intelligence and need of this son. I could write pages and pages about this novel – but it is a novel that is at it’s best when the reader really knows nothing about what is to come. I read it first in a flash and read it again a month later slowly, this time savouring the writing and taking the time to notice the insights and subtleties I missed reading in a rush. Now I am going to re-read Crow Lake and The Other Side of the Bridge because I realize that some of the characters in this novel appeared in the earlier ones, and it has been long enough that I cannot remember the details. It sounds as if this novel could be dark, depressing but it is not. These are people – fictional I know, but they reflect reality – who have suffered tragedy, or loss of some sort that has affected their ability to lead happy lives. Their present is haunted by their past, and they must find a way out – a way of re-connecting with the world, and the people, around them so that their lives are not wasted. It is about dealing with what you are presented with in this life – grieving – accepting or at least accommodating – and getting on with it. There are times when life just is not fair – but it is possible to heal. We witness this throughout this novel and from tragedy comes awareness and ultimately strength. 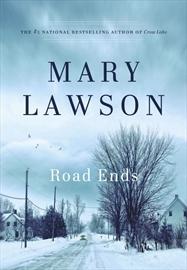 Thanks Mary Lawson for another great book, Road Ends.